Two for the scrap heap yesterday, one to keep. But that was a good day! In the end, I did come up with a design that I'm happy with and one that will make some fantastic jewelry. Here's my brick stitch daisy flower. I'm pretty sure the design will translate to other colors and bead shapes - but even if it doesn't, this is pretty fun. Here's how I got there. 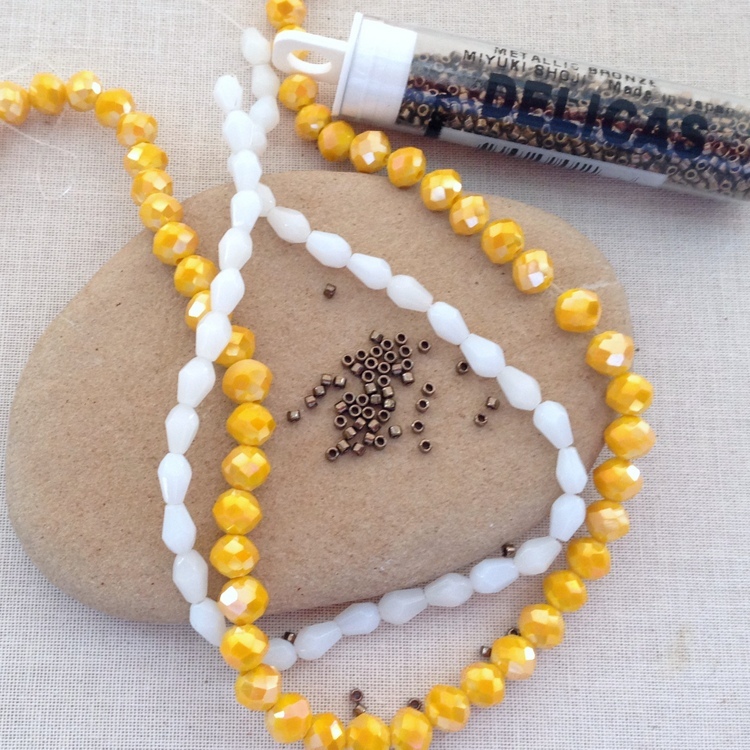 I started with these gorgeous opaque yellow celestial crystal beads with an AB2X finish. I pulled them out to write about AB finishes and I just happened to have the white teardrop beads in a pile nearby. (There are tons of beads in piles nearby - so the coincidence is not that astounding). 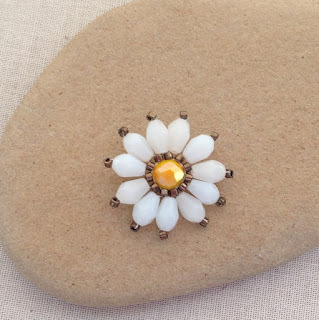 It just screams daisy - doesn't it? It couldn't hurt that I was doing gardening earlier in the day. Now, to put it together. This is the first attempt. I feel like smacking myself for this one. I'm not sure why it even took me making this one to realize the drop beads were going in the wrong direction. I know one of the rules of circular stitches is that it can make it easier when the beads get larger on each round. But I wasn't thinking about the stitch - I was thinking about the shape of a daisy. 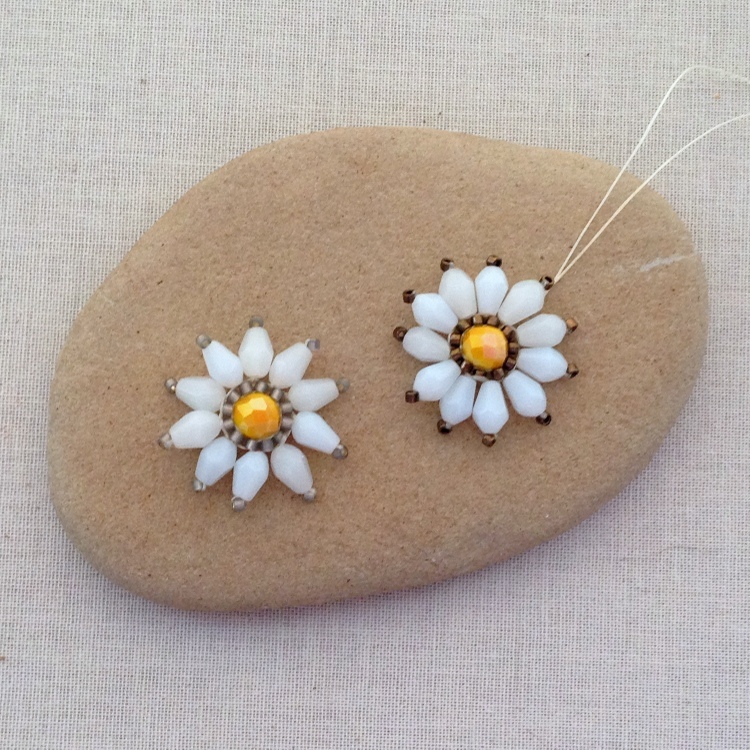 And it seemed like daisies were more likely to be wide at the base and taper towards the end. Regardless of real daisies - it's ok - but you can see the petals don't lay flat. Also, the accent color is not adding enough contrast. That brings me to daisy number 2. The shape is better and the color contrast is dramatically improved in my opinion. But now I realize the stitch is wonky. Both of these have the same technique, one round of circular brick stitch and then the petals are added as an additional round by stitching through the thread bridges. The petals are loose and a little bit floppy. I was ready to settle on this design, because it still looks cute when I realized the final solution. It dawned on me that if the brick stitch round and the petals were all one unit, i.e. one round, not only would it stitch up quicker but it will space correctly since the petals will always be in the thread bridge and force the base round to space correctly. Like when you add a picot edge. So, that's my AHA moment. Treat the petals like a picot edge - which isn't very complicated at all. And that one change, combined with using Fireline 6 lb instead of Nymo D, made this work. If you compare this photo with the prior picture, you can absolutely see how much neater the stitching is - there were overlapping threads in the center that just looked a little messy. 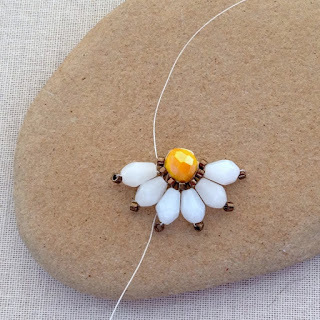 The complete free step by step daisy brick stitch tutorial is available on beadwork.about.com. Now, I'm going to see how it adapts to different color, shape and sized beads - and make some jewelry with these too. 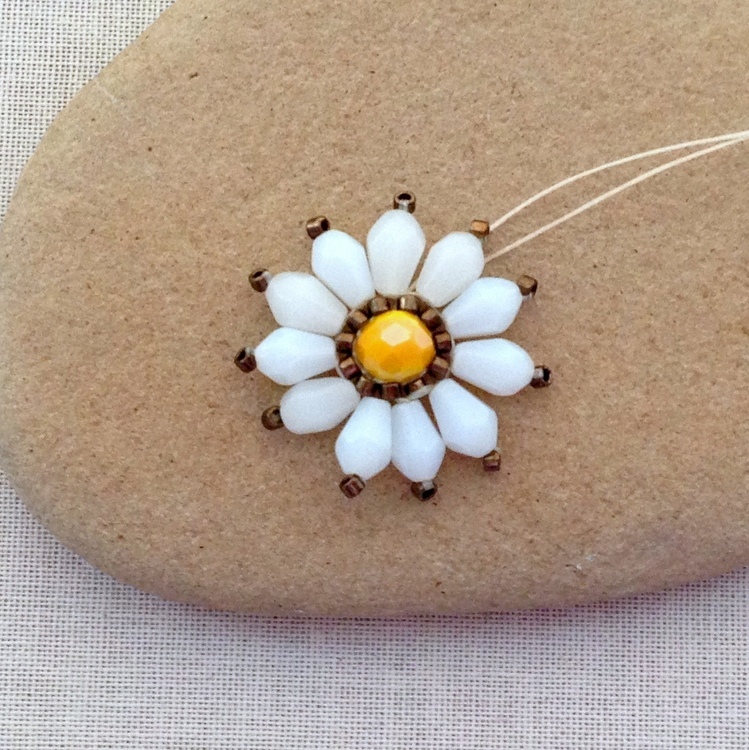 I love getting the beadwork through about.com but I hate having to continually click the next button. Isn't there anyway to view these posts as a whole. As it stands when I see "page 1 of 10" I don't even bother going any further and never even try the tutorial. It's unfortunate but I don't have many other options. That is the only template that has large photos which I think is really important for tutorials. 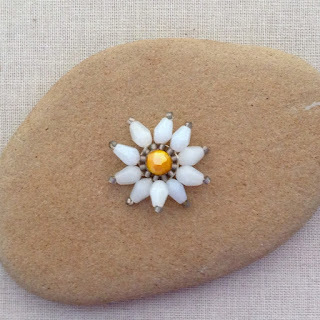 The other multi picture format is like this http://beadwork.about.com/od/beading_patterns_by_theme/tp/Beaded-Daisy-Projects.htm with small pictures. I think they are working on the ability to view the full slide show at once, but until then I think the large photos are important. Thank you for the feedback though! I'm sorry it prevents you from viewing the tutorials. I love the daisy! I like that you're posting your process, not just the final solution. It encourages experimentation! I've been doing picot edge a little differently, as a separate row, stitching up through each bead, adding the picot beads, and stitching down through the next bead (so switching up the stitch from brick to....something else. (?) It's so nice to see options! I did some flowers a while back with flat rounds, then brick stitched seeds, then petal beads (pips?) and 15/0s to cover the "between" thread a little. So fun and summery.